Blonde ombre hair is one of today’s trendiest looks. Ombre look are natural. The roots can make the wig better blend into your real hair. Styles with subtle changes of color blended into dark brown roots make it so realistic. You can get a gorgeous appearance that can truly lift your mood. Ombre is a great any-time color choice, equally perfect for the office or the runway, depending on the level of color contrast. Go for more subtle styles for day, drastic color variations for evening/ performance. I’m living for it. The hair is fine, and I love her. Her name is Beyonce wig. This is my first time to wear a blonde hair. Do you know what? I’m living for it. I want a blonde hair, and this blonde bob wig comes! It’s 12 inches, and 150% density. It’s pretty thick. You know, I have been with long hair for many many years, and this is a bob wig. How pretty it is! It’s so beautiful. And this wig is pre-plucked. So it actually comes with baby hair. All I did is just make is a little bit shorter. What I also like this wig is that it has lace front, it has inches in the front part of the wig. So it is so natural around the hairline. 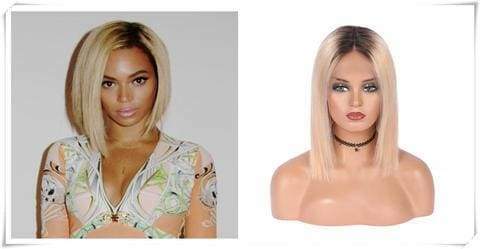 You definitely should try this Beyonce wig if you like blonde look.